Forgive but don’t forget. Live with no regrets. When you forgive, you set a prisoner free. And then you discover that the prisoner was you. Smile And Forgive. It’s The Only Way To Live. You forgive people simply because you still want them in your life. 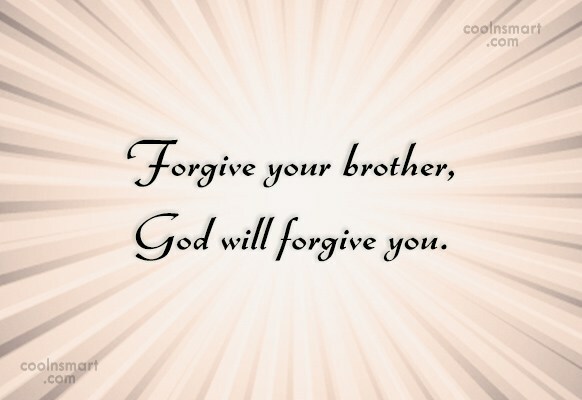 Forgive your brother, God will forgive you. If you are asking for forgiveness from our heavenly father, do not repeat what you have asked forgiveness for. Forgive those insult you, attack you, belittle you or take you for granted. But more than this…forgive yourself for allowing them to hurt you. If someone does you wrong, keep in mind that everybody makes mistakes. Forgive and forget. No one wants to be around someone who constantly makes them feel guilty. The bigger man knows it’s better to forgive than to fight. Just because life is cruel, does not mean that you have to be.